Happy Birthday to J-B (Actually it’s September 13, but before our next haiku)! He hates acknowledging his birthday every year, and yet I feel the need to celebrate him. He has learned to live with it, I think. It’s not like I give him a choice, really, although I met him half-way and didn’t throw him a party… this time. The men in my life have come to realize that I generally get what I want :) Besides, when you find a friend as great as he is, it’s pretty much impossible to ignore important moments in their lives, and I can’t bring myself to do it. Lest he get a swelled head, however, he is truly one of the most stubborn men I’ve ever met, too. Nonetheless, J-B is one of a kind, and I adore him. That’s all there is to it, really. very sweet Jenn, Happy 60th J-B! A Happy Birthday that inspired poetry! 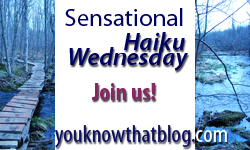 I just happened to have written a ‘number’ haiku the other day on my Haiku blog. Age is all in the heart and mind…the body cringes sometimes, its true…and then everything is just fine. Of course numbers are nothing, being young at heart is what counts!! I love it Jenn!! Cheers to that and celebrations!! How sweet! Happy Birthday, J-B! So glad you’re shouting out a Happy Birthday anyway! Nicely done – safety in numbers, but it’s not living if you’re hiding amongst them. I’m celebrating a milestone (for my mom) 5 months early. I finally did one that is more than the three lines. Hooray for me! Jen, can I be on your Hooked on Haiku list please? Have a wonderful week. ‘See’ you next week. Numbers…celebrate the years, the bigger the number, the bigger the celebration.